"The truth is rarely pure and never simple" (Oscar Wilde). -- This blog reflects my personal life with but not defined by MPS I- reflecting the peaks and valleys of this dx., and my life despite a rare disease while rarely falling within the standard definition of this disorder. 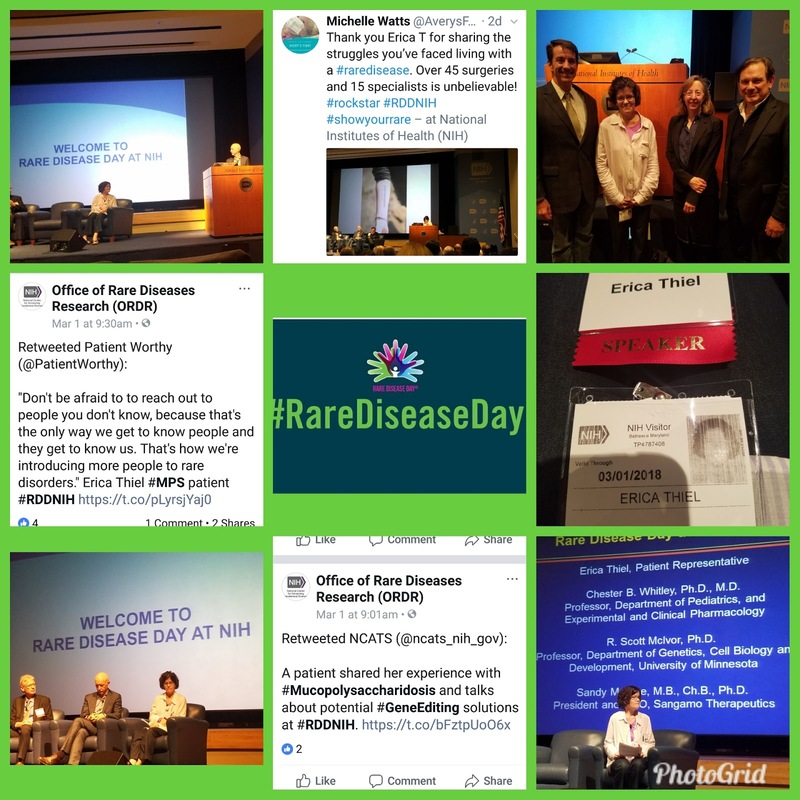 I have to say the Rare Disease Day meeting at the NIH last wk is one of the coolest meetings I've been to (and I would say I've attended my fair share of mtngs now since being diagnosed)! 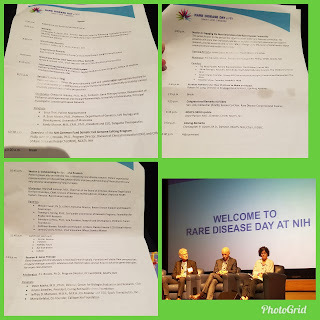 It was honestly amazing meeting the NIH Director (Francis Collins, MD) in person and so many others there who truly seem to care about our rare disease world and what they do! I guess I might be semi easily awed but this day was like nothing other I can compare to - just inspiring! I got in to D.C Weds (flew in to Ronald Regan Airport vs the bigger Intrnt'l (Dulles) Airport which was a lot like flying in and out of Madison or Milw (pretty small for D.C I thought but I know the bigger international - Dulles airport is much larger). 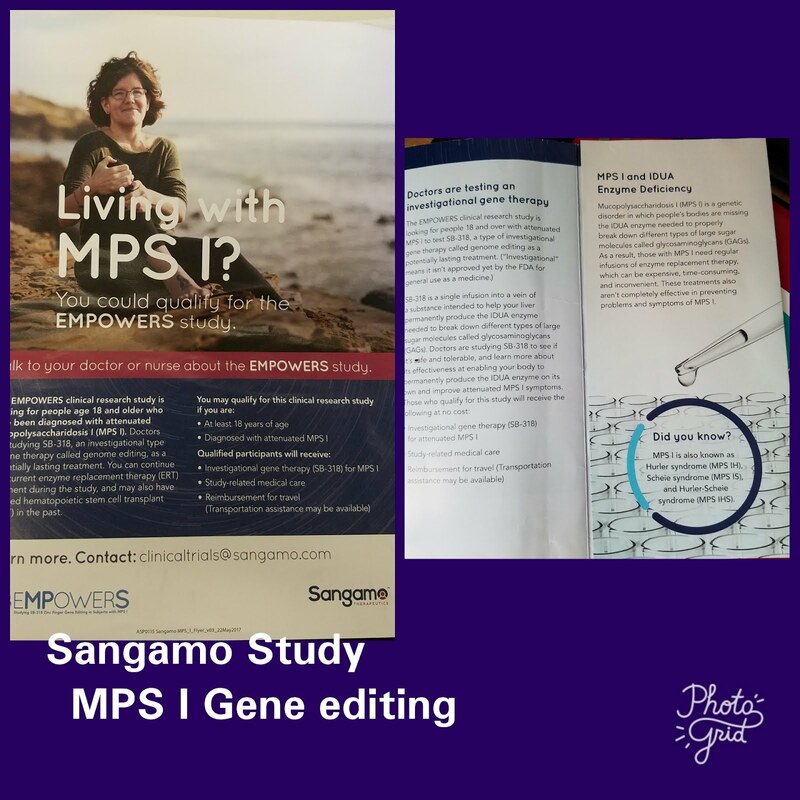 Weds night I met up with the 3 others on my Gene editing panel (Dr.Whitley, Genetics Dr/Researcher from UofMn, Sandy Macrae, CEO of Sangamo (doing the gene editing trials/studies) and Scott McIvor, Researcher at UofMn. This mtng was a really down to earth but also very interesting dinner - it's always nice when your with people who clearly have much more education than I do BUT who are so personable anyways and overall was great conversations. Fairly lightheaded even amongst the serious stuff! Thurs we all met in the hotel lobby and took a car to the NIH (whoa security!) which after a fair period of time (it's extensive!) 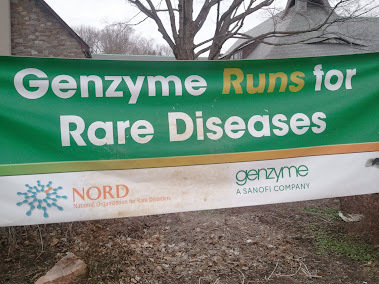 we then got on to campus and to the NIH-RAC bldng where our mtng and panel where being held. SO AMAZING! I can't remember who but someone speaking made the comment they felt like they where walking in the steps of Giants in research and I couldn't have agreed more. 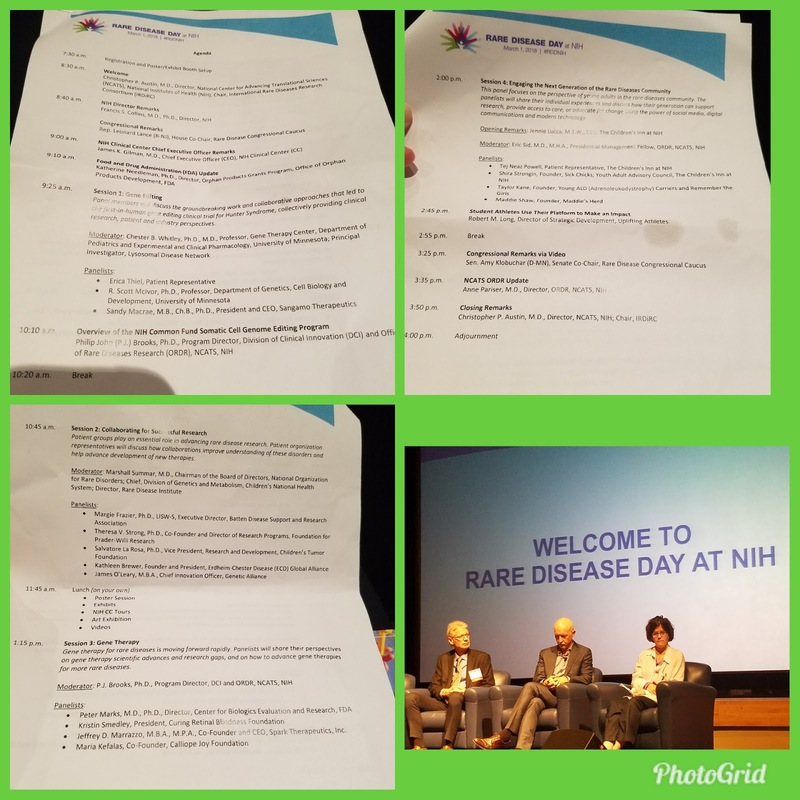 Both speaking as a Patient following in the steps of so many who've come before me and advocated for us Adults as well as speaking from just a overall view - to have seen all the pictures and history in the NIH building we where in was incredibly inspiring! 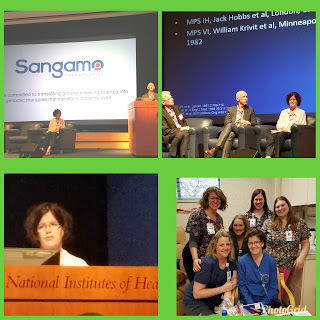 Once I get the pictures from the pictures from the mtng., that the NIH Photographer took i'll share a few of those but for now I've shared pictures I took and that Christeen, the Sangamo Patient Advocacy Director took for me on my phone (she's awesome!). The pictures I and Christeen took are spread throughout this post. As far as my actual (Gene Editing) panel I think this went really well. It had been decided on our panel call a few wks ago that I would lead off our panel followed by Dr.Whitley, Dr.McIvor and then Sandy Macrae (CEO at Sangamo) which in total was about 40mins I believe between all of us. This followed up with several questions from those in attendance, one of which Sandy initially answered and then directed to me (how do Patients and Advocates get involved or get awareness I believe was the question). On a really cool note there is apparently a lot of people who where tweeting about the mtng., + some friends sent me various tweets they found about my specific talk. 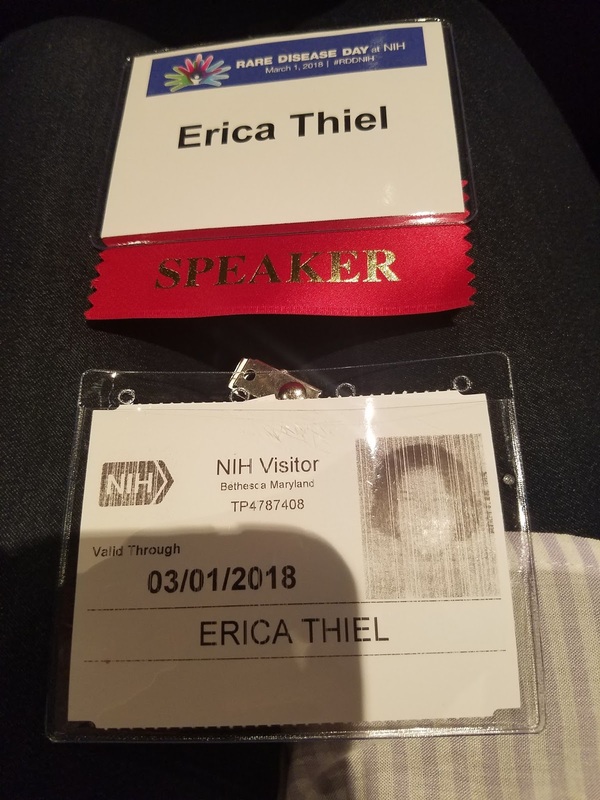 I in no way mean to sound self involved but that really is kind of cool to have made such a impact both the NIH, NORD and people attending where tweeting about my speech! I feel really honored to have been asked to do this and to have had this experience!!! Honestly experiences like this sometimes make up for some of the really crappy days and sometimes really hard situations I struggle with at times in day to day life! I've made the decision to go to the Boston Marathon this yr., which I am really excited for! Cheri, my runner this year and I have really connected and seemed to hit it off well (my runner from 2 yrs ago and I where initially going to pair up again this yr but she ended up not being able to go to the marathon in Boston due to her husbands schedule so we've made the decision her and I will pair up again next yr). My runner I did end up getting paired with, Cheri has been really fun to get to know as well! She works at the company that markets the drug I infuse every wk and we've ended up to have a fair bit in common. 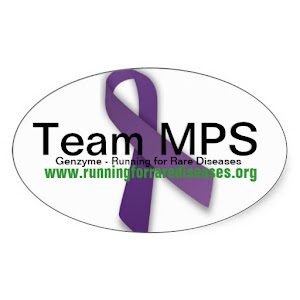 I am really excited for that wknd and works out I am able to see my Genetics dr., before I fly home that Mon (I fly in Sun, our Team dinner is Sat night which I am going to help set up for; the marathon is Mon., I see my Genetics dr Tues and I fly home Weds). Hopefully will be nice weather this yr and should be fun! Is always good to see those on the Team I know from years past! Otherwise a few other things going on but will update those next time. Mostly heart stuff (Team doing a new heart monitor for 5 days to 2wks later this wk) and the shunt stuff is well it just is b/c without a Neurosurgeon willing to help it goes nowhere. I still almost 2yrs later cannot believe I'm back in this (basically) hopeless crap situation b/c I don't have a dr again willing to help. I always feared this would happen and I do really try to trust God has a plan (I know he does) but is so hard sometimes. Thanks for stopping by - I am glad to have opportunities like the NIH mtng and having had the opportunity to talk there as it sometimes helps the crappy times I feel really frustrated! My 5min speech begins at approx. 1hr 4mins and ends 1min 11 (oops guess I went over the 5min goal! In practicing I had been under this time). - On a (not very funny at the time!!!) note my heart rate as I was talking was skipping so bad, which it has been doing for the past week and was doing that morning something fierce. A minute or so in this slowed or calmed a little and I think I got a little more comfortable but man I was a little nerve wracked at 1st! Still the coolest speech I think I have ever been able to give and honestly I've done a few that where really awesome experiences! I am reminded in all the hard times to keep thinking big, today may be hard but tomorrow can be better! "Alone we are Rare but together we are Strong". 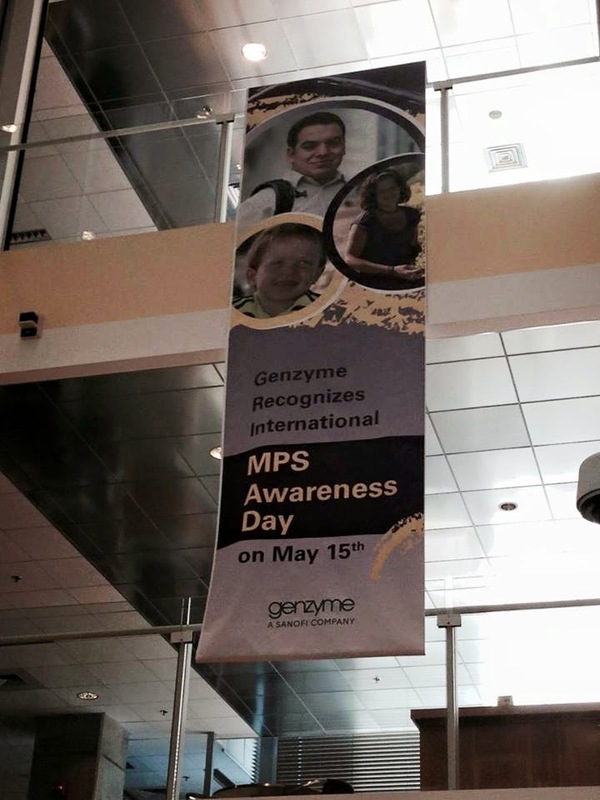 MPS I Hurler Scheie/Scheie Syndrome - Age 35 - Work at GS Foundation; rare disease advocacy. 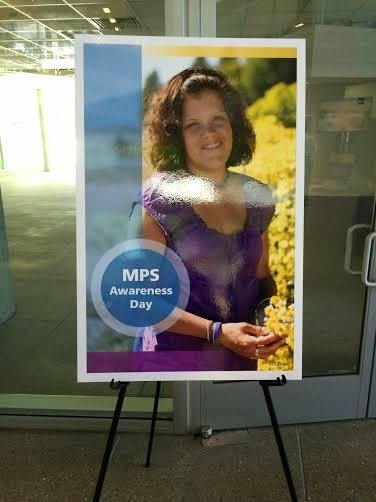 Age 31 WI I work for a rare disease foundation doing advocacy work w/MPS related to research and family outreach. 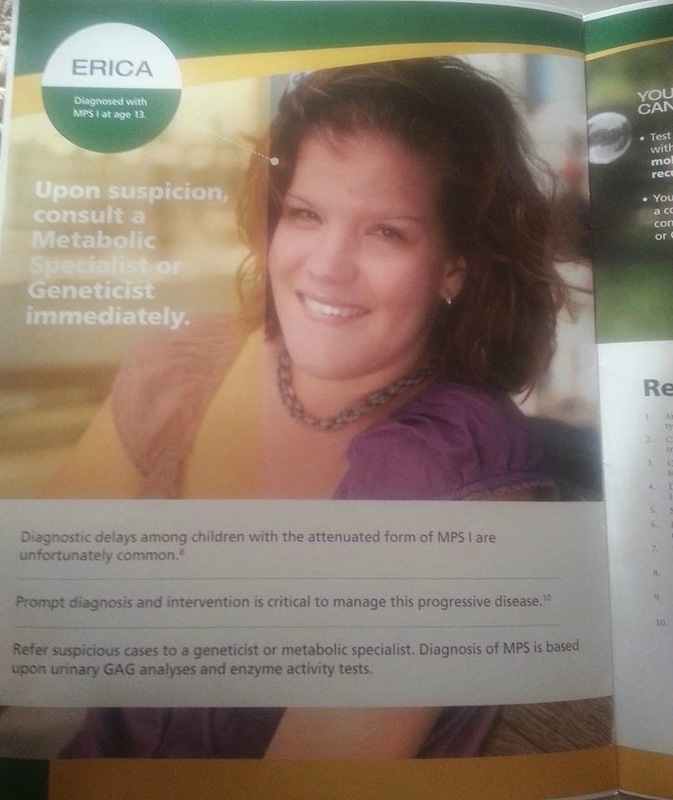 I Live with MPS I Hurler Scheie /Scheie Syndrome a type of mucopolysaccharidoses, (lysosomal)disorder. 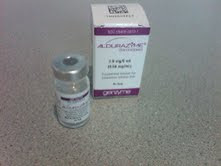 I have been receiving enzyme replacement infusions since May 05. I have had approx 60+ surgeries and procedures in just the last 6 years including 30+ shunt revisions for commun. hydrocephalus in 3 years and and now have an programmable TPL an VP shunts to control pressure. C-spine decompression/fusion, lumbar laminectomies, Port placement, thenar tendon transfer, etc. For past blog entries see: www.caringbridge.org/wi/ericathiel I Love being an aunt - the very best feeling in the world! Being an aunt is particularly rewarding since I personally wont ever be a Mom to my own kids (by choice). 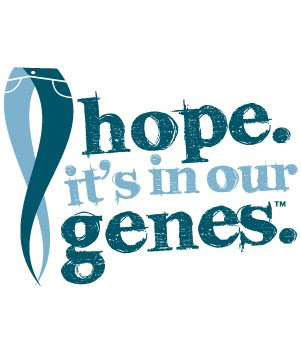 Hope Photo Book - Rare Disease Day 2012 from Hugh Hempel on Vimeo. Shunt failure aka intermittent obstruction and occlusion. Hand Surgery, Botox injections, VBS. Revision/surgery #14: Lumbar drain surgery details. Good, Good, Great!! Cardiology Fup, 3 weeks post-op, Cont'd Valve changes. Watermark theme. Theme images by pixhook. Powered by Blogger.